September | 2014 | George. Jessie. Love. Anyone who knows me will attest to the fact that for the past twenty years, one would be hard pressed to find me without perfectly manicured nails. Not long and never red, just clean, polished, perfectly filed and, even (especially) during the worst of times, flawless. It has been the thing that made me feel in control and, I assumed, conveyed to the world a psychic unity that often eluded me. 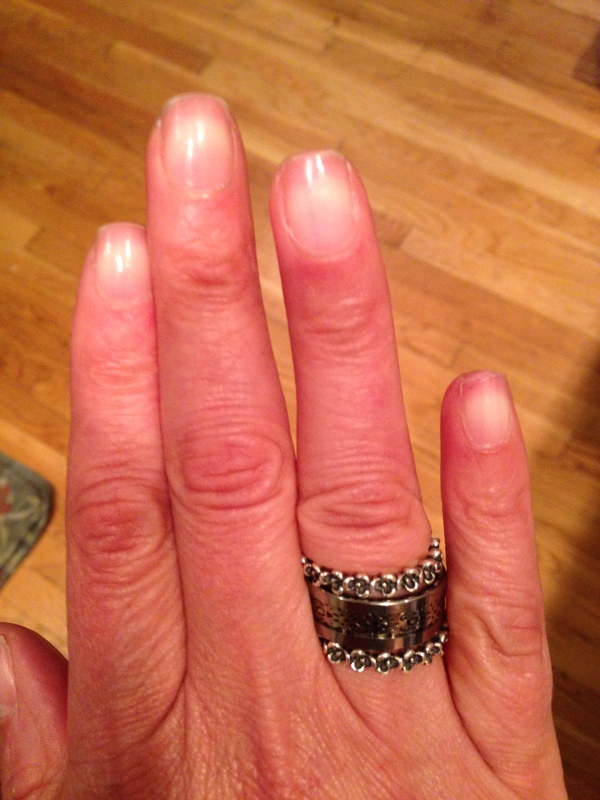 I readily and frequently professed that I would give up food before I gave up my beloved bi-weekly manis. And then last week happened. I had put exactly zero thought to what I was about to do. I had not, in fact, even entertained the idea. Yet, as I sat in the familiar chair struggling with my aluminum foiled covered fingernails* to turn the pages of the most recent “People” magazine I felt not the comfort and calm that always came with manicures, rather I felt agitated and irritated by the process and a little ashamed of the time I was wasting while I should really have been packing up my house to move. He literally stopped and stared at me. I think he jaw might have dropped open a little. It was then that I knew that I was done with this whole ritual, habit, commitment. Now that we are approaching year three of Jess’s transition, my house is sold, I’ve found a place to live, I have a wonderful man in my life and the world is continuing to spin on its axis I realized I don’t need perfect nails any more. To be clear, they are well groomed and will remain so. I actually kinda like the way they look and found myself (almost) getting a little judgey (that’s my made up word for being judgmental) when I see a woman with nails that resemble the way mine used to look. But, rest assured, it has been a fleeting thought as I, perhaps more than most, deeply appreciate the value of a perfect manicure. *Gel manicures changed my life…but in order to prepare the nails for a new coat, one has to wrap the nail in foil and acetone to melt the crap out of them. As noted, it makes for very difficult trashy magazine page turning which, I realized, was a good 75 percent of what I actually needed when I walked into the nail salon. ** That’s “Jewish” for craziness.